UPDATE: Bustin Boards has confirmed that it’s a Bustin Boards Boombox longboard and after seeing the movie, it should be noted that there is only one longboarding scene in Iceland. The other New York scene mentioned in this article is ‘covered’ by CGI which makes it look like Walter Mitty is longboarding on asphalt. All pictures copyright of their individual owners. 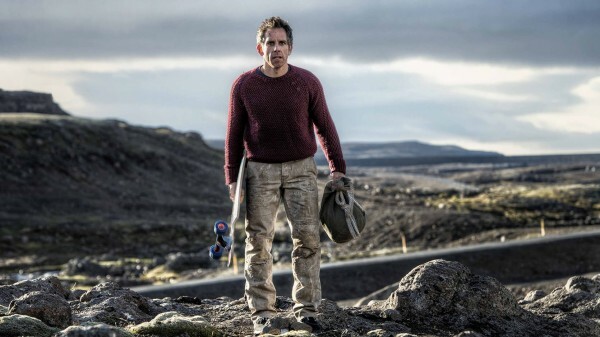 Ben Stiller stars in and directs The Secret Life of Walter Mitty, where he is seen carrying and riding a longboard skateboard in several parts of the movie. At one point he’s longboarding down a hill in Greenland, while in another scene he’s longboarding down a street in New York City. The 2013 movie, which is based loosely on the original James Thurber short story and the 1947 Danny Kaye film, was filmed in Bronx, New York City, Greenland, and Iceland. 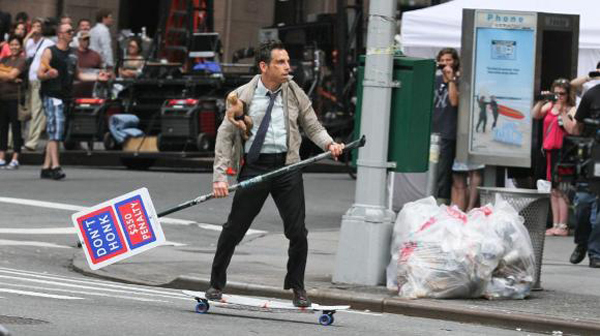 While the movie doesn’t come out in America until December 25, 2013, after watching the trailer I wondered what longboard Ben Stiller was using in The Secret Life of Walter Mitty movie. A reddit thread on longboarding in The Secret Life of Walter Mitty offered up the following clues. According to justchilln, “a Freebord was actually used in a dream sequence in which Mitty is snowboarding down the street of NY. Source- My buddy was the freeboarder.” You can see Ben Stiller filming part of this sequence in New York in this video below. According to user, thewatches, on Reddit, “I saw this movie in a pre-screening in nyc, and it’s fantastic, but they use 3 different longboards in the movie (it’s supposed to be just one board). They change it situationally, some downhill board like a landyachtz or something and two different Bustin boards.” While I couldn’t find a picture of a Land Yachtz longboard skateboard used by Ben Stiller in the Walter Mitty film, the pictures below are most likely a Gravity Ed longboard and a Bustin Maestro Pro longboard. 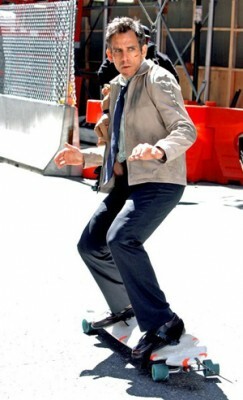 In this image, Ben Stiller is likely riding a Gravity Ed longboard with Freeboard attachments to keep his feet in place. Some have criticized the film for Walter Mitty not wearing a helmet, but in this image he is being hung by wires to keep him up. Originally featured on The Daily Mail on May 7, 2012, Ben Stiller is shown carrying an. “extremely large skateboard over his shoulder”, which is likely a Bustin Boards Maestro Pro Longboard. While I’m not sure how this fits into the story, I did find that on Nov 10, 2013, M Longboard Industry wrote on their Facebook page (translated from French), “What a pleasure when a huge company producing Hollywood knocks on the door of a small workshop shape French … On the occasion of the release of the film “The Life of Walter Mitty” January 1, 2014, 20th Century Fox has decided to win 3, Z-Shape M-longboard-industry autographed by Ben Stiller in person!” and “Ben Stiller on the set of “The Dream Life of Walter Mitty”, on the occasion of the French release January 1, 2014, M-3 longboard longboards industry, the effigy of the film autographed by the actor to be won at the national level through UGC! Soon find all photos of the production of these boards Z-Shape.” The associated picture was that of Ben Stiller holding the sign post, which is a different longboard skateboard than the other two longboards shown. What are the 3 Longboard Skateboards used by Ben Stiller in The Secret Life of Walter Mitty? I have emailed customer service at Gravity Skateboards, Bustin Boards, Land Yachtz, and M Longboard Industry, but have yet to get a response about if any of their longboard skateboards were used in the Walter Mitty movie. However, both the movie and Bustin Boards are located in New York City so there’s a high probability that the movie used a local company. Gravity Skateboards are out of California, Land Yaachtz are out of Vancouver, BC, and M Longboard Industry is out of France. Gravity Ed Longboard – used in street scenes in New York city – buy on Amazon. Either the Land Yachtz Longboard Time Machine or the M Longboard Industry X Board as used in other parts of the film – buy on Amazon. If you have information about what longboard skateboard was used by Ben Stiller in the 2013 Secret Life of Walter Mitty Film, please let me know in the comments below or on Twitter. Matt at M Longboard Industry Matt points to this Rad Train article as evidence that Ben Stiller used Dregs Skateboards. I can’t find any hard evidence of that, nor can I find the original Concrete Wave Magazine article that supports it, but I will admit that the Dregs Blade Crest longboard does look a lot like the one used in the film. Josh Dickey, managing editor at The Wrap, said on Twitter that the downhill scene in Greenland features a LandYachts Wolf Shark longboard. If you’ve seen the movie and know what skateboard Rich is using in the park or think you have a different explanation for the longboard used, please let us know in the comments. Thanks! Nice board, I have a land yachts also. Thats so cool. Ah I saw the film yesterday (I thought it was really good by the way) and just caught a glimpse of the bustin boards logo, I got so excited haha, I have a maestro mini and I love it! The downhill board in Iceland could also be an Arbor Prodigy. Arbor Collective claimed that’s what it was on their Instagram account. Ben’s trucks are NOT on backwards. Shows what that guy knows. There’s two main types of trucks for skateboards. The traditional “Independent truck” style of geometry, and the newer, “reverse kingpin” style. This is the latter, so many people might THINK they are on backwards, but they are not. If they were, I’m sure Ben would quickly figure it out, because leaning left, he’d turn right, and vice versa. He is using 3 different skateboards that are infact Bustin. The board he gives to Rich and he gets from the trade from the Greenland Kids are a Bustin Boombox, while the actual board he is seen riding down the hill is a Bustin EQ. He finishes the slide on the EQ, and the board changes back to the Boombox next scene. In the e-mail sent to Walter, there is the 3rd and final board. It is a Bustin Maestro, and you can tell the different shape if you look closely. They all have Paris 180 trucks mounted properly and Bustin Swift wheels, until the e-nail video where Rich mounts smaller/harder black skateboard wheels on instead of the Blue Bustin Longboard wheels. I’m pretty sure that Bustin on the right is a Boombox. I have one. The big question is this: at the end of the DH ride Mitty slides to a stop. Then he kicks his board up into his hands. But how? The board has absolutely no tail!! But I can’t see how it would make sense to use CGI here instead of just switching to a board which has a nose and tail … which is what he starts out on but they keep changing.